In Voting Rights Arguments, Chief Justice Misconstrued Census Data : It's All Politics Chief Justice John Roberts noted that Massachusetts, which is not covered by the preclearance section of the Voting Rights Act, has a far worse record in black voter registration and turnout than Mississippi, which is covered by the act. But census statistics don't necessarily confirm that argument. 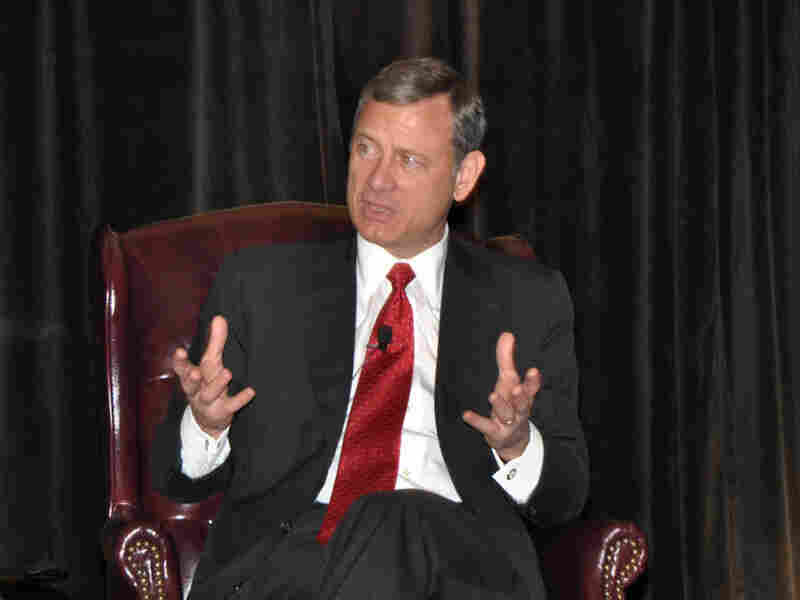 Chief Justice John Roberts, shown here during a presentation last June in Pennsylvania, questioned the U.S. solicitor general about voting statistics during this week's arguments on Section 5 of the Voting Rights Act. At the voting rights argument in the Supreme Court on Wednesday, Chief Justice John Roberts tore into Solicitor General Donald Verrilli, grilling him on his knowledge of voting statistics. The point the chief justice was trying to make was that Massachusetts, which is not covered by the preclearance section of the Voting Rights Act, has a far worse record in black voter registration and turnout than Mississippi, which is covered by Section 5 of the act. But a close look at census statistics indicates the chief justice was wrong, or at least that he did not look at the totality of the numbers. Roberts: "Do you know which state has the worst ratio of white voter turnout to African-American voter turnout?" Roberts went on to add that the state with the best record, where African-American turnout actually exceeds white turnout, is Mississippi. Roberts' questions and conclusion appear to be taken from a census survey cited in a lower court dissent. But upon close examination, the numbers are less than reliable, according to the Census Bureau itself. Here's the deal. The Census Bureau does voting surveys to look at voting patterns nationwide, but the survey is based on a very small sample. Most recently, in 2010, the survey looked at 94,208 voters nationwide. Break that up into roughly proportional samples in each state, Census officials say, and it is really not possible to compare states because those with relatively low minority populations have a much higher margin of error. That means that factoring in the margin of error, the black turnout rate in Mississippi could be as high as 54.1 percent, or as low as 43.3 percent. So, if you factor in the margins of error at their extremes — with Mississippi at the low end and Massachusetts at the high end — Mississippi could have had a black voter turnout rate that was 7.5 percentage points lower than Massachusetts. Bottom line, as Census officials told me, these numbers are simply not reliable for state-by-state comparisons because of the high margins of error in some states.